Lima beans are legumes. Legumes are, primarily, beans. That would include black beans, kidney beans, lentils and lima beans. Now this may surprise you: peas and peanuts are legumes, too! Lima beans make the creamiest “warm your tummy” comfort food – you just have to try this! Lima beans have a subtle buttery flavor that makes a nice compliment to a meal. I, however, love my lima beans as the meal! My mom introduced me to lima beans and pork when I was just a child and they have been a favorite ever since. Vinegar is the perfect condiment for this dish. Creamy lima beans, small pieces of pork and vinegar! Love it! If you enjoy vinegar in other dishes – like tossed salad – then you MUST give this dish a try. It is inexpensive and nutritious*. Lima beans and pork is easy to make. It stores well and can be frozen for future use. * 15g protein and 13g fiber per 1 cup serving plus lots of nutrients such as B vitamins, calcium and iron! Place the dry beans in a large saucepan and fill it with cold water covering the beans completely. Allow the beans to sit overnight. They will soak up a lot of the water and swell in size. Drain and rinse them well. Add a coarsely chopped onion. Turn the heat down so that a very soft boil is maintained. Boil for 30-60 minutes, stirring occasionally, till there is a creamy sauce and the beans are soft. Season with salt, pepper and garlic powder to taste. Add cut up cooked pork or ham. Serve in a bowl with cider vinegar as a condiment. One 16 oz bag of large, dry lima beans can feed 4-8 people. This recipe freezes well. Just cool it and spoon it into a freezer container. I recommend separating the recipe into more than one container so that you don’t have to thaw a large amount unless you know you will be using it all at one time. 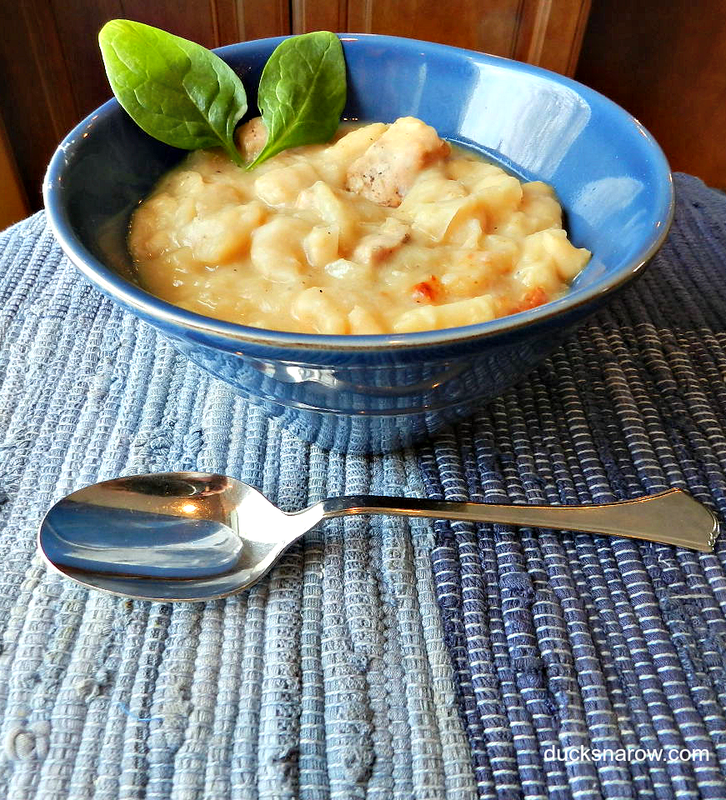 Lima Beans and Pork – healthy, nutritious comfort food! Tip: I did not have cooked pork on hand so I took a package of fresh thin-sliced boneless pork chops, seasoned and fried them in a skillet. 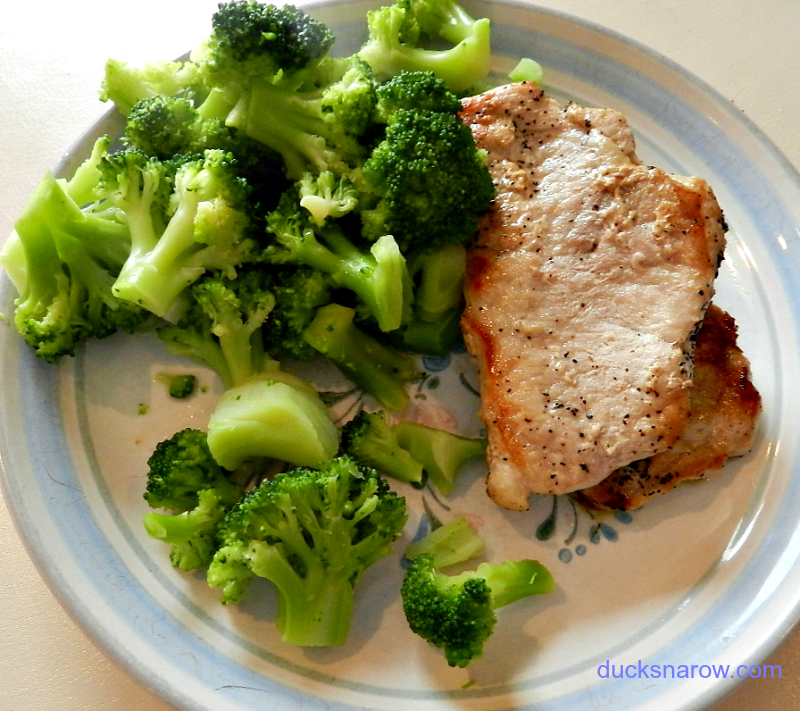 Then I cut up half of the pork to add to my lima beans for flavoring and ate the remainder for a delicious pork and broccoli lunch. The lima beans were our dinner! Previous Post: « Chili Salad Recipe – Best Leftovers Recipe Ever!